Two young ladies wearing eclectic costumes, powdered white by the ever- present alkali dust of the Black Rock Desert, slowed their bicycles near our camp before calling out. “Where are we?” It was an innocent question, for the streets of Black Rock City – the famous Burning Man gathering in northwest Nevada – can be disorienting if one is not paying attention to the road markers. “5 and Kundalini,” I answered, indicating our spot on the city’s street grid. It is, indeed: Where are we? Imposing this inquiry upon Western civilization, we find ourselves pondering our location on the overlapping grids of religion, philosophy, and ideology. Helping us to better grasp our position, Game of Gods takes us on an intense journey wherein the road markers point to a new era. And where the roads intersect, new edifices of religion, politics, technology, and culture are being constructed. The Judeo-Christian structures are being dismantled and replaced; we are witnessing the creation of a new global neighborhood. Its builders anticipate a coming synthesis, and Oneness becomes the banner under which they work. As we consider what this entails – at its core, a truth claim in conflict with another truth claim – we will begin to comprehend the nature and scope of our changing times, coming face-to-face with the transformation of the Western soul. Much of our attention, therefore, will be on the features that have re-set the Western heart and mind. To help navigate our journey of discovery, Game of Gods has been separated into five sections. The first is comprised of two chapters exploring the concept of Oneness, a theme running throughout the book. Part two is a progressive survey outlining the history of Western thought and social change, touching on the rise and fall of Christendom, the exploration of Modernity and Postmodernism, and the emergence of New Spirituality and Re-Enchantment. The third section tackles Biblical approaches to the topic, necessary for a rounded perspective: God as separate and unique from creation, the recurring spirit of the first deception, and the concept of collective rebellion. Part four contains a series of mini-books, expanded essays on the political, religious, technological, and cultural aspects of Oneness. The book’s conclusion – Part Five – is a single chapter meant to spur our thinking as we contemplate responses. Although this book is content rich, it is by no means exhaustive. Many relevant personalities and historical developments have been excluded. Little is said of Islam or Catholicism, sexuality, pop culture, current affairs, or international security concerns. At one point I considered adding a chapter on world monetary issues, a tangible part of the larger question. At first glance this seemed like a shoe-in as I was published in the field. However, because of ongoing developments in crypto-currencies and distributed ledger technologies, I chose to refrain. That said; this book is research saturated. With that in mind, a few words on research preferences are in order. For those with an eye to the footnotes, it will become apparent that relatively few Internet sources are cited. Even though I was an early adopter of the World Wide Web, it is only one item in the toolbox – a multi-use implement, to be sure, but not the single or primary means of conducting investigation. Electronic documents are sourced, but references to hardcopies are the norm: books, reports, and journals. Most are publicly obtainable, but I do use papers from archives and private holdings. Personally conducted interviews and surveys – important for digging below the surface – are occasionally employed, as are surveys done by others. The most valuable research method I have found, however, is to be there: to literally put boots-on-the ground, observing and interacting, taking notes and collecting data, and otherwise documenting the event in question. Another consideration is that this is primarily a critique of big ideas and grand visions. Personalities are mentioned, but care is taken to focus on concepts and beliefs more than individuals. We can scrutinize, criticize, probe, and reveal without resorting to depreciating someone’s character. At times this can be a fine line, one that I have crossed in my own life. Nevertheless, as Christians we are to love our neighbors, including those who fundamentally disagree with us. This does not mean sugarcoating uncomfortable topics, but neither does it mean acting disrespectfully or bearing false witness. It is my sincere desire to be as accurate as possible, a difficult task when covering so many subjects with such brevity. To my friends who are globalists, transhumanists, atheists and agnostics, who are Burners and spiritual explorers and those of other religions, I am thankful you are willing to read my book. To my friends who are socialist leaning, Christian and otherwise, I am grateful you are willing to consider what I have to say. For the many Christians who are concerned about the direction of church and society, who know something is amiss but find it difficult to grasp where we are, I trust this book will be of value. To those who cherish liberty, may this reinforce the seriousness of freedom, and thus turn our hearts to the only one who can truly set us free. Obviously I have biases. We all do. Allow mine to be transparent: I embrace a Christian worldview with an evangelical point of reference. This will be evident in the text. I am pro-liberty and pro-individualistic, versus politically directed equality and socially generated collectivism. Economically I am pro-free market, the voluntary and consensual exchange of goods and services. On the left-right spectrum, with left being understood as maximum government and minimum personal responsibility, as opposed to minimal government and maximum personal responsibility, I am right of center. In many respects, Game of Gods is an historical overview. For to under- stand tomorrow’s context today, we need to have some idea as to where we are now. To do this we must investigate yesterday, for the present did not emerge from a vacuum. Along the way, we will travel to more recent events of world transformation: closed meetings like the United Nations Millennium Forum, and open-source experiments in social engineering, like Burning Man. If you are interested in the connecting points of religion and philosophy, ideology and history, belief and action – then this book is for you. Agree or disagree with my thoughts or findings: but either way, challenge yourself to consider why, and to work through the implications. Some may be asking: Why? What might be gained by digging into complex worldview issues? A number of thoughts come to mind. First, so we are not uninformed as to the direction and character of culture and society, seeing past the hype, rumor, and sensationalism. Second, to connect the dots of our own life experiences; the main themes in this book are foundational, being relevant irrespective of demographic or social identifiers. Third, to take heed of the revolutionary transformation in play, and therefore mentally and spiritually equip ourselves – and our families, churches, and communities – so as not to become gullible participants. For the Christian specifically, to know how the Biblical message is being challenged, and primarily those truth claims central to the faith. Then, to recognize how the culture is preaching to us, seeing past the packaging in order to spot the pitch. In doing so, we become responsible in at least two ways: 1) to wisely inform, exhort and uphold those we are responsible to: family and friends, youth groups, and church congregations, 2) to recognize opportunities in bringing Biblical truths into the conversation, taking the approach of the Apostle Paul in Acts 17 – knowing, recognizing, and leveraging the dominant worldview to share a more sure answer. In other words: To become effective Ambassadors for Christ. Game of Gods does more than just position us on the grid. It explores the essence of the human story, reflected in each of us, and it offers a panoramic picture of our changing landscape. Welcome to the Age of Re-Enchantment, reads the sign-of-our-times, pointing to our reconstructed neighborhood. And there, at the crossroads of politics and religion, technology and culture, myth and meaning, a familiar yet distinct tower arises, wrapped in the mist of ages while beckoning with the promise of a new future. The Temple of Man looms before us. Humanity has three Great Desires: To be as God, to be Masters of Meaning and Destiny, to build Heaven on Earth – this is that story. 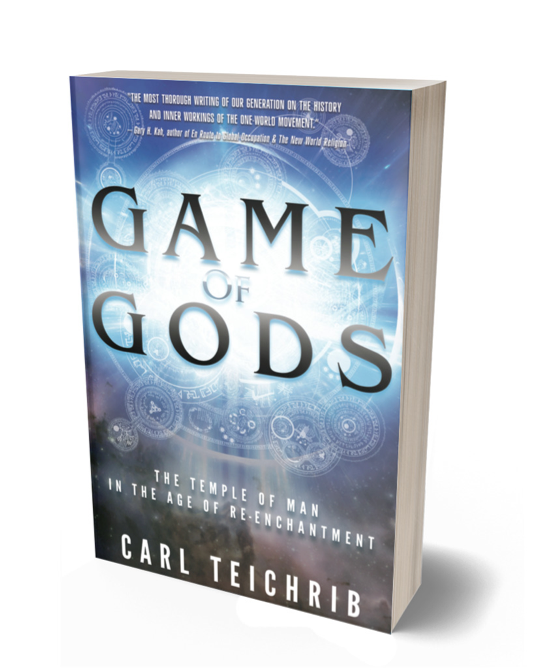 Game of Gods is the most thorough writing of our generation on the history and inner workings of the one-world movement. – Gary H. Kah, author of En Route to Global Occupation & The New World Religion. One of the most brilliant pieces of work ever written on how the Judeo-Christian narrative has been abandoned in our politics and culture, replaced by a me-god worldview. A must read… for such a time as this! – Cindy Hartline, host of Love For The Truth Radio. Timely truth with flawlessly documented research, unparalleled scope and insight. – Debra Rae, author of ABCs of Globalism.